Bajaj Auto revealed their new brand identity today in Delhi. At a press conference presided by Bajaj Auto MD, Mr Rajiv Bajaj and NITI Ayyog CEO, Mr Amitabh Kant; Bajaj revealed their new global brand identity. Claiming to be loved in 70 countries across the world, Bajaj Auto’s new tag line is – The World’s Favourite Indian. 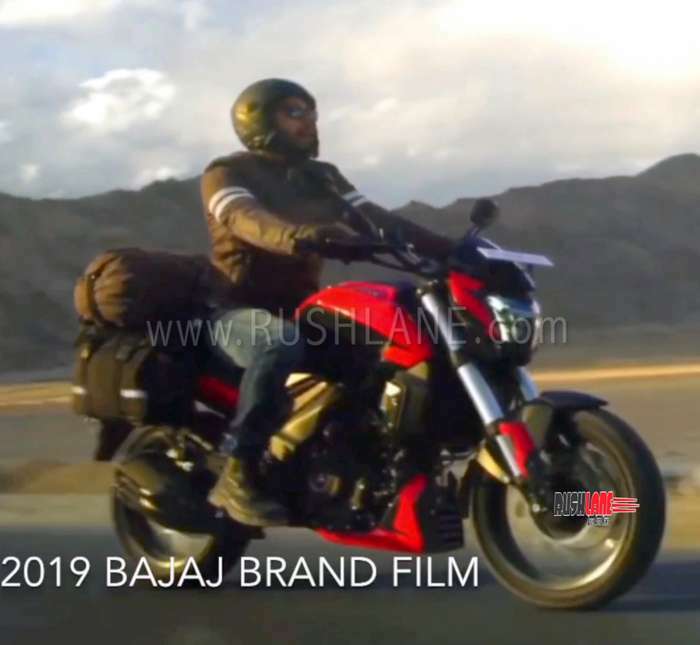 To celebrate this announcement, Bajaj also launched a brand film, in which the 2019 Dominar has been revealed. Set for launch in the coming days, 2019 Dominar is one of the most awaited motorcycles by enthusiasts. Select Bajaj dealers have opened bookings (unofficial) for the new 2019 Dominar 400 at a down payment of Rs.10,000. Slated for launch later this month, the 2019 Dominar will sport new cosmetic and mechanical updates and will comply with new safety regulations being implemented in the country. 2019 Bajaj Dominar 400 will feature a new instrumentation displaying average fuel efficiency, fuel consumption and service reminder. There will also be another display on the fuel tank with gear position indicator, clock, odometer and two trip meters. The most notable change on the new Dominar 400, which distinguish itself from its current counterpart, is the inclusion of inverted front forks in the place of telescopic units. Rear suspension will be the same multi step adjustable mono shock, as seen on its current counterpart. It also gets a new exhaust system along with a more muscular rear tyre hugger. Braking is via 320mm disc brake in the front and 220mm disc at the rear. With the new safety standards coming up in India, Bajaj is likely to offer only dual channel ABS version on the Dominar 400 in the Indian market. Non ABS variant will not be on offer. Watch the official brand film video below. Reports also suggest that the 2019 Bajaj Dominar will come in with the same engine, but tweaked to deliver better power and performance. This 373.2cc, liquid cooled engine, triple spark, 4 valve DTS-i engine currently delivers 35 PS power at 8,000 rpm and 35 Nm torque at 6,500 rpm mated to a 6 speed gearbox. Currently, it is a SOHC setup, in the 2019 edition, the setup is DOHC, similar to Duke 390. Slipper clutch with ride by wire is also expected. A larger radiator will ensure better cooling. Expected starting price is to be in the region of Rs 1.8 lakhs, ex-sh.